You might get the urge to pour yourself a cup of tea while watching Downton Abbey. Earl grey or English breakfast might satisfy your craving for a cuppa – but you might just want something that fits in even better with the show. 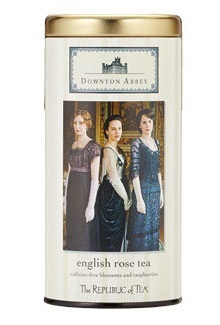 The Republic of Tea just released English Rose Tea, a special Downton Abbey edition for all the fans out there. The herbal tea is made with a blend of hibiscus, rosehip peels, apples, raspberry, vanilla and rose petals, for a blend that is both sweet and flora. It’s also caffeine free, so you don’t have to worry about being kept up all night after watching the latest episode – and if you stay up late wondering what is going to happen next, you can’t blame it on the tea.